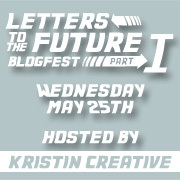 Kristin Creative: My First Blogfest!! Letters to the Future! To celebrate 300 followers, I'm hosting my very first blogfest!! Recently, here on my blog, I apologized to my future published self for my lack of confidence and laziness in the present, seriously delaying my career as an author. Several of you thought that was a fun idea, so I decided to make it into a blogfest so we could all give it a try! 1) Sign up for the blogfest on the Mr. Linky widget below. 2) On Wednesday, May 25th, write a letter to your future self and post it on your blog. It doesn't have to be an apology like mine, it can be about anything! 4) Help me spread the word! It's a fun and easy blogfest that your followers might like to join too! Thanks so much for following!! I can't wait to read all your letters! Sounds like fun Kristin! I'm in! I love this kind of thing. It sounds awesome. What a fun idea! And congrats on surpassing 300 followers :)) I'm going to pass, only because I just finished the A-Z blogfest and I'm so blogged out I could cry. (Not really.) But I do need a break and I've told myself the month of May will be for working on my new MS. But thanks for the email, and I plan to put your link on my sidebar to help you promote! Have a blast with it!!! Yay!! Great idea...count me in. Consider me down for the fun. I'll write a letter to my future self, I'm just not sure what it'll say, but that's half the fun! YAY for the possibilites of books as well! Who doesn't love! I'll tweet and post it on my sidebar this evening! I'm in! Yay for blogfests! Sounds like fun. It's always interesting to conjecture about whom we'll be in the future. Writing a letter to ourselves is sort of like leaving a time capsule for our later selves to find. Fun idea! I am a new follower too! Hey Kristin! Congrats on the 300+ followers! What an accomplishment! This blogfest sounds like fun. I'm looking forward to it! I forgot to add that I would love to enter for the giveaway. Email is ahxockin87@gmail.com and the badge for this giveaway has been posted on my sidebar! Great idea, I found you through the comment exchange on YA Addict. So glad to have a new blog to follow in my dashboard. Sounds great! See ya in the future :) And congrats on 300 followers. Great idea! Congrats on the followers! Okay, I'm in! Sounds like fun. :) Thanks for hosting, Kristin. I'm in! I <3 blogfests! Joining up at the last minute - plus new follower. :) Great blogfest idea!